A once-in-a-lifetime adventure awaits in the heart of the Arabian Desert as a new extraordinary experience takes guests through Bedouin history and breath-taking landscape. Rising from the depths of the Arabian Desert, a unique adventure awaits guests to Four Seasons Hotel Riyadh at Kingdom Centre in the form of a ‘Journey to the Edge of the World’. With unprecedented access to Saudi Arabia’s magnificent natural wonder, the Tuwaiq escarpment, the new Extraordinary Experience in the Four Seasons Hotels & Resorts collection promises a trip of a lifetime. In the company of a dedicated Four Seasons team – the excursion begins at the historic oasis of Ad’Diriyah, once the seat of the Saudi royal family and home to a Unesco World Heritage site. After a captivating trip through the Kingdom’s historic past, narrated by the 15th-century architecture of palaces, forts and mosques across the old city, and a lively exploration through the colourful market centre of Al Bujairy, the next stop is the awe-inspiring destination – the Edge of the World. 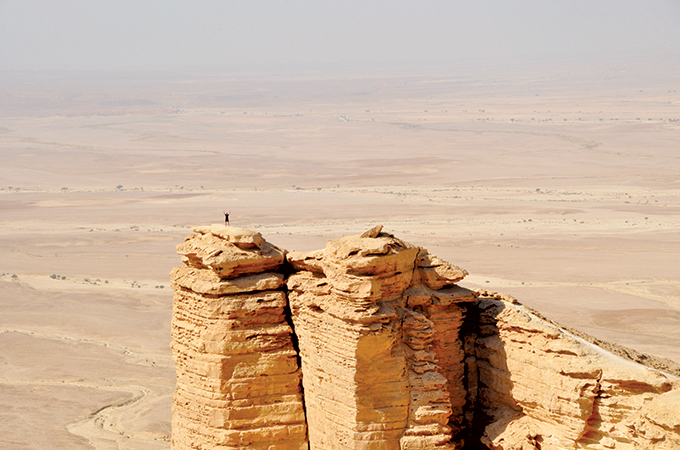 The epic scale of the 700km-long Tuwaiq escarpment from Jebel Fihrayn, with its cliff that is known as the Edge of the World, brings to life the extraordinary experience that is promised. Even as the guests take in the sights of the Edge of the World, the talented Four Seasons culinary team, led by the Hotel’s executive chef Ahmed Fawzy, prepare gourmet spread of traditional cuisine and BBQ dishes – the perfect complement to the Arabian Desert experience. Revitalised by the hearty spread, the afternoon may be spent trekking, photographing the dramatic views of the cliffs and the plains below, or taking a nap in the restful shade of the own Bedouin tent – complete with true Four Seasons hospitality. For the most adventurous, this is the ideal moment to take to the skies and enjoy a magnificent view of the expansive landscape from the cockpit of a microlight aircraft. The day ends as beautifully as it began, amongst the acacia trees in the valley below, where guest may watch the setting sun as it paints the surrounding scenery with colours of twilight. The Journey to the Edge of the World Extraordinary Experience includes transportation in a Cadillac Escalade, a traditional Bedouin tent with fully-equipped washrooms, and Four Seasons BBQ lunch and traditional Saudi cuisine priced at SR2,200 ($587) per person for a minimum of five guests. The experience can be booked between October and April every year. Optional extras include a microlight aircraft experience for a maximum of 10 people, priced on a full-day basis at SR8,500 ($2,266), and a family entertainment package that includes archery, mini golf and Ludo Star and is priced at SR4,500 ($1,200), for a full day. Guests booking the Extraordinary Experience can also enjoy a stay at the Hotel in an executive suite with breakfast at a special rate of SR2,000 ($533), per night for two guests.